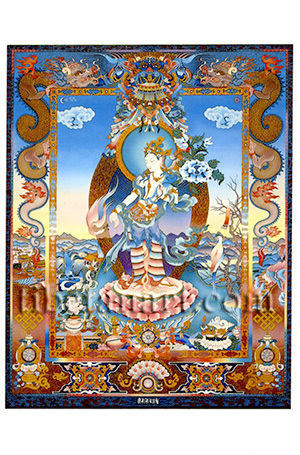 Padmapani, meaning 'lotus-in-hand', is the main two-armed form of the bodhisattva of compassion, Lokeshvara (Avalokiteshvara). He is white in complexion and stands gracefully upon a moon disc and lotus. He is adorned with the five silk and eight jewelled ornaments, and wears the emblem of an antelope-skin over his left shoulder. His right hand is extended downward in the gesture of generosity, as a gracefully swooping pheasant offers him a stem of three jewel-fruits, symbolizing the 'Three Jewels' of the Buddha, Dharma and Sangha. With his left hand he holds the stem of a lotus that blossoms at the level of his ear. On his right a female bird perches, and the pair of birds symbolize the union of his compassion (male) and wisdom (female). He stands within a luminous and transparent aura amidst a beautiful landscape. An elaborate silk parasol floats above his head, and various offerings are placed before him. The outer frame of the painting displays the 'face of glory' (Skt. Kirtimukha) at the top, a pair of dragons on either side, the eight auspicious symbols in the lower corners, and a fanlike crest of mantras flanked by two ornate pedestals across the bottom.